We are engaged in manufacturing and exporting a variety of Air Curtains that are used to avoid the outside air to enter in cooled or heated area through an opening. Our product range includes Powder Coated Air Curtains, Aluminum Air Curtains, Stainless Steel Air Curtains, Vertical Air Curtains, Filter Air Curtains, Human/ Magnetic Sensor Air Curtains and Custom Air Curtains. They are comprised of a protective shield for rejection of unwanted air, dust, smell and noxious odor, temperature loss, smoke and insects. These air curtains are used in several applications, including restaurants, hospitals, auditoriums, offices, banks, hotels, ac showrooms, airports and many more. We are Looking for Industrial Air Curtains Buyers and Industrial Air Curtains Distributor in Himachal Pradesh Baddi, Nalagarh, Kala Amb, Barotiwala, Parwanoo, Solan, Una, Bilaspur industrial Areas. NSC Air Curtains are available in various models ( both horizontal & vertical) and in five different velocities. They are suited for door openings starting from 2.5 Ft. Wide and in velocities ranging from 13 mtr/sec to 25 mtr/sec and above. These velocities are divided into five different model for the convenience of our privileged customers. NSC Air Curtains are available in various models ( both horizontal & vertical) and in five different velocities. They are suited for door openings starting from 3 Ft. Wide and in velocities ranging from 13 mtr/sec to 25 mtr/sec and above. These velocities are divided into five different model for the convenience of our privileged customers. 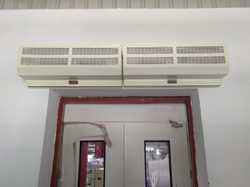 We are the Manufacturers, Supplier, Distributer Of Industrial Air Curtains. These Air Curtains are comprised of a protective shield for rejection of unwanted air, dust, smell and noxious odor, temperature loss, smoke and insects. 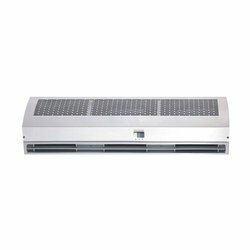 These air curtains are used in several applications, including restaurants, hospitals, Pharma Industries, Food Industries, auditoriums, offices, banks, hotels, ac showrooms, airports and many more. As a Manufacturing company,We are manufacturing Air curtains,Fly Killers,Hand Dryers and PVC stripscurtains. 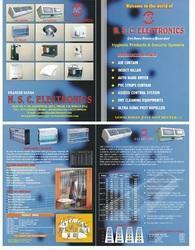 we have Different Models in Various sizes, to suit any kind of special requirement if you have. Incase you need any clarification, you can call me on 09815048244. 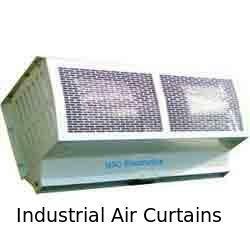 We are the Manufacturers, Supplier, Distributer Of Industrial Air Curtains. These Air Curtains are comprised of a protective shield for rejection of unwanted air, dust, smell and noxious odor, temperature loss, smoke and insects. These air curtains are used in several applications, including restaurants, hospitals, auditoriums, offices, banks, hotels, ac showrooms, airports and many more. The primary purpose of our Industrial Air Curtains is to prevent the influx of outside air through an opening in to heated or cooled area. Our Air Curtains also sport several environmental protection data and they include the abilities like protective cover from unwanted air rejection (85-95%), smell and noxious odor (85-95%), dust, smoke & insects (80-90%), temperature loss (10-25%). 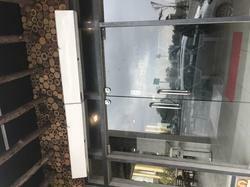 The regular distances wheel and ultra quite wind wheel can produce the powerful Super Sleek Air Curtains. It is made of high tech ABS/PP. It adopts the technology of electrical machinery. It runs smoothly with powerful air-flow it operates reliably. And runs safely for 5,000 Consecutive hours. Air Door Curtains is a modern device which, when installed on a door, forms an invisible curtain of continuous air and thus prevents escape of conditioned air as well as entry of outside hot, humid and polluted air. Stainless steel air curtain thus not only cuts down your electricity bill, but also helps in maintaining cleanliness and hygiene up to the required standard. So, using a Stainless steel air curtains is not a bad idea. We are the leading manufacturers and suppliers of all kind of Air Curtains and customaized Air Curtains. Air curtains is a modern device which, when installed on a door, forms an invisible curtain of continuous air and thus prevents escape of conditioned air as well as entry of outside hot, humid and polluted air. 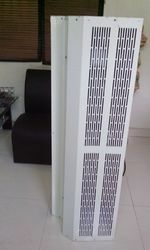 Stainless steel air curtain thus not only cuts down your electricity bill, but also helps in maintaining cleanliness and hygiene up to the required standard..
Flame Proof Air Curtains is a modern device which, when installed on a door, forms an invisible curtain of continuous air and thus prevents escape of conditioned air as well as entry of outside hot, humid and polluted air. Stainless steel air curtain thus not only cuts down your electricity bill, but also helps in maintaining cleanliness and hygiene up to the required standard. So, using a Stainless steel air curtains is not a bad idea.